Photo: Jay H. Boulton House, ca. 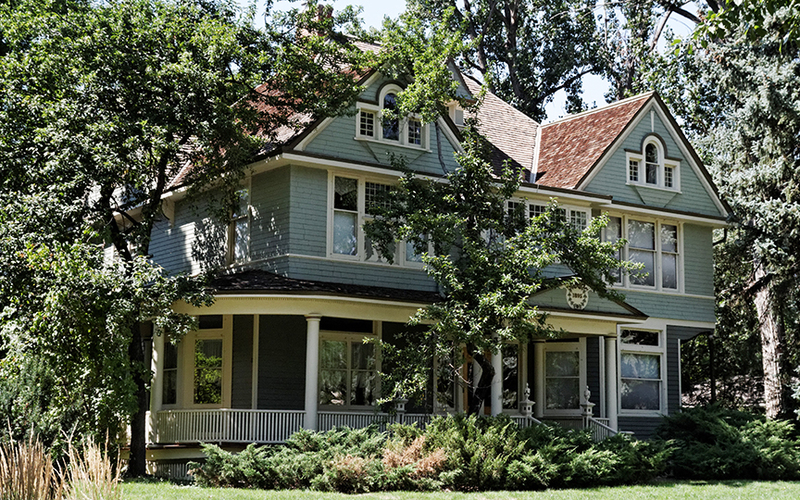 1895, 113 North Sherwood Street, Fort Collins, CO. Listed on the National Register of Historic Places in 1978. Photographed by user:Gribeco (own work), 2012, [cc-by-3.0 (creativecommons.org/licenses/by/3.0)], via Wikimedia Commons, accessed December, 2013. The Larimer County Courthouse is located in the Justice Center, 201 La Porte Avenue, Fort Collins, CO 80524. County Administrative offices are located at 200 West Oak Street, Fort Collins CO 80521; phone: 970-498-7000. [In the early 1800s] ... a party of Portuguese adventurers set out from Mexico and wandered northward along the chain of the Rocky Mountains until they reached the vicinity of Long's Peak. They prospected for gold northwest of Boulder and disappeared, leaving mankind none the wiser. Before 1810 the fur-traders had ventured into the wilds of northern Colorado. About the year 1816 a company of 45 "voyageurs" (as the French trappers and hunters used to be called) found their way to a point a little northwest of where Denver stands. They were in the employ of the American Fur Company, with headquarters at St. Louis. So Dr. James relates in his narrative of Long's expedition. A score or so of years later Kit Carson and his band of mountain men trapped through Estes Park. However, little was known of this region until Fremont passed that way and described it in the report of his first expedition, in 1842. On his second expedition (in 1843), the Pathfinder left St. Vrain's Fort and struck across the country in a northwesterly direction. His route lay up the Poudre River and then along the base of the Medicine Bow Range into southern Wyoming. Although not the first white man to visit this section, he was the first geographer to give an account of it to the world. Fremont was an intelligent observer, and he rightly judged the land northwest of Fort Collins to be fertile and productive. Its apparent barrenness he attributed to the dryness of the climate. It was midsummer, and he was delighted with the magnificent flora of the eastern slope. He writes: "The slopes and broad ravines were absolutely covered with fields of flowers of the most exquisitely beautiful colors." Mountain sage was abundant, the plant (or bush) growing from 2 to 6 feet in height. Not long afterward a French trapper, Antoine Janise, established a trading post just above the present town of La Porte. The Indians generously donated the land. "On the first of June, 1844," he says, "I stuck my stake on a claim in the valley, intending the location selected for my home should the country ever be settled. At that time all the streams were very high, and the country black with buffalo. As far as the eye could reach, scarcely anything but buffalo could be seen. I was just returning from Mexico, and thought the Poudre Valley the loveliest place on earth, and have not since changed my opinion. The gold fever broke out in 1858. ... In the winter of 1858-1859 settlers and prospectors came flocking in." Near Janise's place on the Poudre River was a small settlement of a dozen or more French mountain men, who had Indian wives. In the early days Robert Chambers and son, of Iowa, built a cabin near the mouth of Big Thompson Canon. Chambers Lake was named for the old trapper. The county was named in honor of General William Larimer, one of the founders of Denver. A prominent thoroughfare of the Queen City was named for him. Larimer County is bounded on the north by Wyoming, on the east by Weld County, on the south by Boulder County, and on the west by Jackson County. The crest of Front or Medicine Bow Range forms the western boundary. The eastern part of the county consists of rolling plains; the western portion of foothills and mountains. The north half of the county is drained by Cache a la Poudre River, which rises in Medicine Bow Mountains and empties into South Platte River east of Greeley.